Visit Evigno during your stay in liguria, italy. Evigno offers a variety of excursions. Mountain bikers in particular will get their money’s worth in this place. The numerous routes in the Ligurian hinterland present a real adventure park. Hiking tours through beautiful natural scenery are also available here. Moreover there is a great tennis court in Evigno beckoning you to play. There are great restaurants and cafes to strengthen you for the return trip down by the sea. For all gourmets the "Panorama Dianese" Restaurant is worth visiting. It is located in Via S. Bernardo, 18013 Diano Arentino. Beside excellent meat dishes vegetarian dishes and especially the homemade pasta are also a specialty. Whoever wants to relax on the beach and discover the coast is within a few minutes’ drive at the coast and the sea. For those seeking tranquility and relaxation but would still like to make excursions, Evigno is the right choice. Evigno is a village in the Diano Arentino Municipality located high in the hinterland of Liguria. It was settled in the Middle Ages and was incorporated in the Diano Arentino Municipality in the 12th Century. 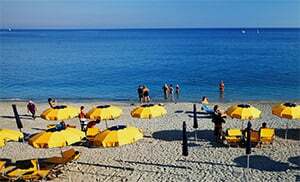 Evigno is part of the Diano Arentino Municipality and is a village in the Imperia Province located in the Liguria region. There are several other villages near Evigno like: Roncagli (4.3 km), Diano Arentino (2.3 km) and Camporondo (4.8 km). Take the highway exit San Bartolomeo al Mare from Genua then take the SP34 up to Evigno.